Home » Collection » Lou Reed, poet-musician (hero to avant-guard Czechoslovak intellectual rock-band dissident "Plastic People of the Universe" defended from government persecution by playwright Vaclav Havel and his Charter 77 friends) at make-up table in green room, public Theater Lafayette Street New York, invited by impresario Rose Lesniak (above) to Master Ceremonies, Premiere of Poetry- Music Video Clips by June Waldman ("oh! oh! plutonium") and myself ("Father Death Blues"), September 1984. 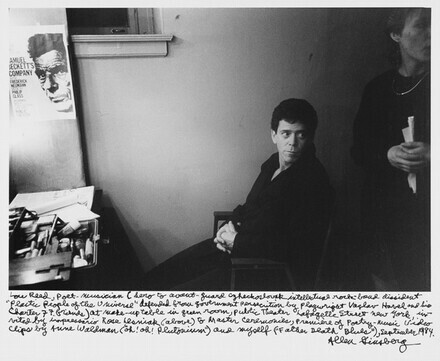 Lou Reed, poet-musician (hero to avant-guard Czechoslovak intellectual rock-band dissident "Plastic People of the Universe" defended from government persecution by playwright Vaclav Havel and his Charter 77 friends) at make-up table in green room, public Theater Lafayette Street New York, invited by impresario Rose Lesniak (above) to Master Ceremonies, Premiere of Poetry- Music Video Clips by June Waldman ("oh! oh! plutonium") and myself ("Father Death Blues"), September 1984.